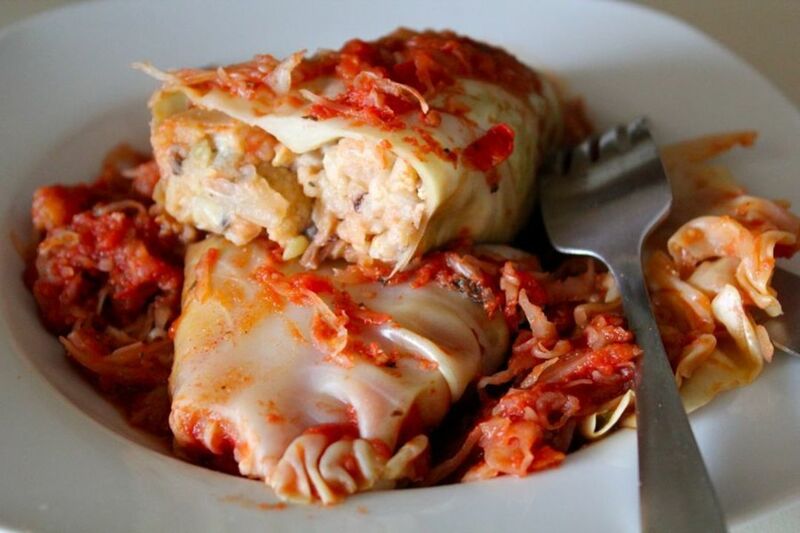 Stuffed cabbage, known by the Ruthenian name halupki by my family, is an icon of Eastern European cuisine. The recipe I learned from my Nana is made with a stuffing of ground meat and rice, and cooked in a big pot of tomato sauce and sauerkraut. It’s long been my dream to make this meal veggie-friendly, so I present to you my tastiest effort, made with a stuffing of roasted cauliflower, brown rice and black-eyed peas. Darn skippy. Preheat oven to 425 degrees and line a baking sheet with foil. Remove leafy core from bottom of cauliflower and cut into large florets. Arrange on baking sheet and drizzle with olive oil. Roast until tips are browned and florets are easily sliced through, about 30 minutes, tossing halfway through. Set aside. Bring a large pot of water to a boil. Carefully submerge the whole head of cabbage and allow to blanch for about 5 minutes, using a wooden spoon or pair of tongs to ensure all sides are softened (it will tend to favor one side). This makes the cabbage leaves malleable, so that you can easily roll them up. Leave the water on low heat; as you pull away the outermost leaves you may find that the inner leaves are still rigid, in which case you will need to resubmerge for a few minutes. Once cauliflower is cool enough to handle, roughly chop and place in a large mixing bowl. Add rice, black-eyed peas, garbanzo flour, jalapeño, onion, salt, and pepper. Mix well with a wooden spoon or clean hands, until all ingredients are thoroughly combined. To make the cabbage rolls, carefully remove one leaf of cabbage from the head. They tend to wrap all the way around, so take care to lift slowly and gently so the leaf doesn’t tear as you remove it. Lay flat on a clean workspace, with the natural curve of the leaf facing upward (so it creates a little bowl rather than a dome). Form about 1/3 cup of the cauliflower filling into an oblong ball with your hands, packing it tight. Place the ball in the center of the leaf, then fold the stem up and over it and roll from one side to the other, tucking the tip of the leaf in as you go. There’s no right way to do this (according to me, that is)—some of mine come out long and round, others stubby and square. The main thing is to make sure it’s tucked up nice and tight so that the filling doesn’t escape as it cooks. Set stuffed leaves aside on a clean plate or platter. Once all filling has been used, tear up remaining leaves and throw them into the bottom of a large pot. Add a thin layer of sauerkraut (about a third of the jar), then arrange one layer of cabbage rolls. Top with about half of the tomato sauce, then follow with another layer of sauerkraut and cabbage rolls. Top with all remaining sauce and kraut. Bring pot to a boil over medium high heat and then reduce to a simmer. Allow to cook until cabbage is tender and flavors are well integrated, about 45 minutes. Serve one or two cabbage rolls in a bowl with lots of sauce, kraut, and a piece of crusty bread with butter.